Dark and Full of Terrors! Game Masters shouldn’t waste their time sketching maps every time surface-dwellers brave the ominous earthen depths. 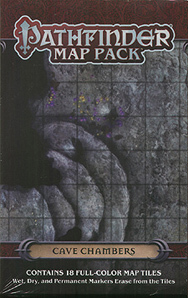 With Pathfinder Map Pack: Cave Chambers, you’ll always be ready whenever buried treasure beckons!